This class is an every other year class sponsored by the GLSPS. The class is a custom designed class in collaboration with the GLSPS and Scott Wemyss (Main Instructor) from Air Down There Scuba. The class will be held at the Lund's Community Room at 13081 Ridgedale Dr. Minnetonka, MN. 55305 on Wednesday, April 11, 2018 from 6:00 to 10:00 PM. 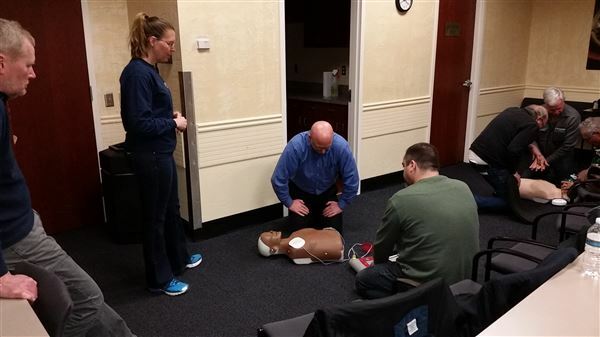 A fee of $75.00 covers both First Aid, CPR, AED and the O2 training. With the fee, you will receive a PADI First Aid certification card and a separate SDI O2 certification card. You will also receive a Quick Reference Guide on a card during the class and two certification cards. One with the First Responder and the other with the O2 Certification. This is all part of the class fee. Every time the class is offered it gets that much better! 4. Oxygen assessment, application with bags and positive pressure ventilators. We will be touching a little bit on restricted airways. 5. Proper back board procedures. 6. Proper rescue procedures of a drowning diver. 7. Lightly discussing real in and out of water rescue. 8. Light discussion on DCS symptoms to watch for, treatment and transporting. These and many more real world scenarios will be discussed, and simulated and practiced at the class, if applicable. If interested in the Certification or re-certification, please register for the class by clicking on the "Register Button" above. After you register, you will be receiving a confirmation from the GLSPS. Please print your copy to prove payment to Scott from Air Down There Scuba. A review and practice on Anne and Andy (practice dummies) during the class. You will be receiving two certification cards for all the above procedures after you have practiced these procedures, are comfortable and ready to use them on a real live patient. You will be pleasantly surprised on how much more you will learn or, don't know about saving someones life or a loved one. Thank you to those that participated in this Class! The Class started on time at 6:00 PM and we covered all the topics in the above list. For most of the crew the class was a review but there were a few folks that were in the class that haven't experienced the customized class setting. They had a great time learning more about what the organization has to be trained for, given the many remote areas we travel to for our projects. Many times the EMS is not available for 30 minutes to an hour. We need to be able to stabilize a patient until the EMS arrive. Everyone passed the class and were re-certified. The students that took the class will receive a new certification card indicating they are up-to-date on their Emergency First Responder Certification, AED Operation and oxygen application, along with bag use and restricted air ways. The back-board procedure is always intriguing by itself. Thank you to all that attended the class. We are grateful that we are able to offer this class to the GLSPS Members. Please remember, all GLSPS Members and Non Members are welcome to join us for this class. The GLSPS wants everyone to know how to save a life to the best of their abilities through the training available to them. We hope to see you on a GLSPS Project this year. Thank you again for those that participated in the EFR Class.